We’d love your help. Let us know what’s wrong with this preview of I Don't Want to Be a Frog by Dev Petty. Frog wants to be anything but a slimy, wet frog. A cat, perhaps. Or a rabbit. An owl? But when a hungry wolf arrives—a wolf who HATES eating frogs—our hero decides that maybe being himself isn’t so bad after all. To ask other readers questions about I Don't Want to Be a Frog, please sign up. How long did it take to write this book!? It won't let me read it what do I do? we both loved this one!! what a fun read! A frog with an identity crisis. Imagine that! I Don't Want To Be A Frog is about a Frog that is not particularly thrilled with who he is. Frog says: "Let me ask you something... If you could be any animal in the world, what would it be? Probably NOT a Frog, right? Exactly." Frog would rather be a Cat. Warm and fuzzy! Or a Rabbit. Or better yet, an Owl! Even being a Pig seems like a more appealing option, even if he'd have to eat garbage. He just doesn't want to be a Frog, Frogs are wet and slimy, and they always eat bugs. But he can't be a Cat. He doesn't have ears so he can't be a Rabbit either. And he doesn't look wise enough to be an Owl. And let's face it, he couldn't really eat garbage. But you know what? Being a Frog isn't all that bad after all. At least wolves don't eat Frogs! Why? Because they don't like wet, slimy things filled with bugs! Ha! Dev Petty's newest children's book is simply fantastic. It's clever, witty, fun, and - above all - smart. It will teach your kid about identity. Your child will learn that even though he or she may sometimes wish to be someone else entirely, it's important to realize that we are who we are - unique, special, different from everyone else - and accepting this will bring happiness. There are times my kids seem dissatisfied with everything, but I'm also sure that there are times when all I say is NO. This hilarious book takes that situation and produces laughs in all the right places--the perfect medicine for crabby kids and peevish parents. Little frog is sure he doesn't want to be a frog. As he sits reading a book about cats, he decides that would be the perfect animal to be. "I want to be a cat," he declares to his father. Nope, his father says, you're a frog. Back and fo There are times my kids seem dissatisfied with everything, but I'm also sure that there are times when all I say is NO. This hilarious book takes that situation and produces laughs in all the right places--the perfect medicine for crabby kids and peevish parents. Little frog is sure he doesn't want to be a frog. As he sits reading a book about cats, he decides that would be the perfect animal to be. "I want to be a cat," he declares to his father. Nope, his father says, you're a frog. Back and forth the dialog goes, in easy to read expressive short sentences--perfect for reading aloud together. Hey--little frog can hop! He should be a rabbit, he tells his father. "You can't be a rabbit," his father calmly replies. No long ears, right? "I don't like being a Frog. It's too slimy," little frog whines. Little frog isn't easily persuaded. And his father's wise words don't sink in at all. Kids are loving Mike Boldt's illustrations, especially how expressive little frog is. They love knowing that the dad is right, but I think they're rooting for little frog too. And the conclusion leads to giggles from everyone who's read it in our library. This is the story of a frog who would rather be anything other than a wet, slimy, bug-eating amphibian. Anything — he’s sure! — would be better than being a frog. He can hop like a rabbit, and he’s sure he could stomach garbage like a pig, but one by one his alternatives are proved unsatisfactory. It isn’t until a hungry wolf with a diverse appetite comes along that frog realizes being just who he is isn’t so bad after all. Laughs and a worthwhile message about being yourself are guaranteed! This is the greatest book ever! Little frog doesn't want to be a frog. He wants to be ANYTHING but a frog. The illustrations are stupendous and the story compelling. This is a story you'll read over and over and not mind one little bit. Every now and then, I will ask myself, Oh, why not read a Children's book? And the reply comes, let's do it. Let's be frogs and happy. A fantastic children's book. This book delivers a great message and a lot of laughs. Why be a slimy, wet, bug eating frog when you can be another animal? That's what little frog wants to know. He's tired of being a frog. He wants to be something else. Something like an wise old owl, or a warm and fuzzy cat or a rabbit. After all he can hop, and so can a rabbit. Even being a pig who eats garbage doesn't seem so bad. As little frog finds out, many of the things these animals can do, are things he A fantastic children's book. This book delivers a great message and a lot of laughs. Why be a slimy, wet, bug eating frog when you can be another animal? That's what little frog wants to know. He's tired of being a frog. He wants to be something else. Something like an wise old owl, or a warm and fuzzy cat or a rabbit. After all he can hop, and so can a rabbit. Even being a pig who eats garbage doesn't seem so bad. As little frog finds out, many of the things these animals can do, are things he can't do. In fact, out of all the animals he wants to be, not one of them eats bugs like he does. Though he's told he can't be anything other than who he is, the young frog still has hope in changing. That is until he meets a hungry wolf. Lucky for frog, wolves don't eat frogs, but they sure do enjoy eating many of the other animals frog wanted to be. Thanks to wolf, frog realizes that being a green, slimy, bug eating frog isn't so bad after all. But of course the little frog will find out by himself the advantages of being a frog. For example not being part of some frightening individual food chain! Funny story with two adorable characters. It is completely written in dialog form, and speech bubbles are used. The pictures are attractive, colorful without being strident. Age range: 4 to 7 years old. Cute illustrations and I liked the repetitive nature. On the other hand, not sure I 100% agree with the entire theme (view spoiler)[yes, be happy with yourself, but don't limit yourself, either? But maybe that's a bit more complex considering it's a frog trying to change species rather than an individual trying to break free of that whole nature vs nurture bit (hide spoiler)] but it was adorable. If I could give a book 10 Gold Stars, this book would have it. A great book for kids of all ages! Wonderful bright illustrations and a catchy story makes for a perfect book for storytime and read-aloud. Highly recommended. This book is literally so cute. My third graders loved this one. Pair this with "Wide-Mouth Frog" for a Frogs-avoiding-being-eaten storytime. 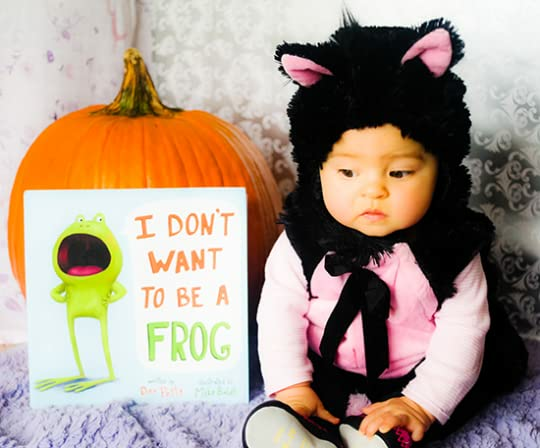 My granddaughter pretends to be a frog each time we read this beautifully illustrated book about being yourself. I love the illustrations and simple dialogue in this book as a young frog expresses his desire to be a cat ...or rabbit...or pig...or... and as he learns why it is good to be himself. A young frog doesn’t want to be a frog for various reasons. While his father tries his best to explain why he can’t be the other types of animals he wishes to be, it’ll take an unlikely visitor to convince the young frog he’s lucky to be exactly who he is! I loved that it is a conversation between a boy and his father. Cute story with a good ending. Frog would rather be a Cat. Warm and fuzzy! Or a Rabbit. Or better yet, an Owl! Even being a Pig seems like a more appealing option, even if he'd have to eat garbage. He just doesn't want to be a Frog, Frogs are wet and slimy A frog with an identity crisis. Imagine that! Dev Petty's newest children's book is simply fantastic. It's clever, witty, fun, and - above all - smart. It will teach your kid about identity. Your child will learn that even though he or she may sometimes wish to be someone else entirely, it's important to realize that we are who we are - unique, special, different from everyone else - and accepting this will bring you happiness. "When I was younger, I enjoyed playing soccer, but in middle school, soccer games became more competitive so I started comparing myself to the other players. All I wanted was to be an amazing soccer player like Mia Hamm. Well in this story, Frog does not want to be a frog anymore. Have you ever wished you were different in some way?" "Frog's going to learn a lesson about being who we really are. See if you can figure out what lesson he learns." I begin the opening by telling a personal story about a text-to-self connection. Then I ask students to make their own connection to the story. I end by telling students to look for the lesson of the story and challenge them to find it. If I had a nickel for every parental proverb heard when growing up (and thereafter), I could fill the shelves with books in a new school library. Two of the top contenders were "Haste makes waste" and "Many hands make light work" with "The grass is always greener on the other side" coming in at a close third. When, in the course of my teaching, the opportunity presents itself when one of these might be appropriate, I seal my lips rather than succumb to any adult adages. Arguably there are times w If I had a nickel for every parental proverb heard when growing up (and thereafter), I could fill the shelves with books in a new school library. Two of the top contenders were "Haste makes waste" and "Many hands make light work" with "The grass is always greener on the other side" coming in at a close third. When, in the course of my teaching, the opportunity presents itself when one of these might be appropriate, I seal my lips rather than succumb to any adult adages. Arguably there are times when situations demand speed and doing a project yourself makes more sense. Unless you are comparing an estate maintained by a gardener with an overgrown vacant lot, experience teaches us appearances are not necessarily what they seem. 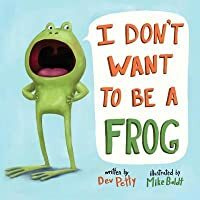 I Don't Want To Be A Frog (Doubleday Books for Young Readers, February 10, 2015) written by Dev Petty with illustrations by Mike Boldt explores with hilarity the drawbacks and benefits of being yourself. Frog wants to be anybody, or anything, but a frog. "You think I like always being wet and cold?" asks Frog to his father. His father asks what other animal would he be and has a ready answer for why he can't be that animal. He points out Frog is a frog and can only be a frog. A cute story about someone wanting to be someone else and having that discussion with his father. It is a great way of showing how you need to accept who you are and they way you are. I liked that it is not a "you are special" kind of book but has humour about acceptance of yourself rather than having others tell you are great. Great illustrations as well! I liked it. It wasn't the best ever. There is a lesson in being happy with who you are, but I'm not sure if that was the book's purpose. The end part had a twist in the humor. But the whole wolf showing up seemed odd. Didn't fit as a story, just as a lesson being taught. Not quite sure what the school-age kids would think of this. But it might be fun to try in storytime and see what the younger kids will think. 5/4/16 Used in O is for... theme. Had them tell me at end why. They kept pointing out I liked it. It wasn't the best ever. There is a lesson in being happy with who you are, but I'm not sure if that was the book's purpose. The end part had a twist in the humor. But the whole wolf showing up seemed odd. Didn't fit as a story, just as a lesson being taught. Not quite sure what the school-age kids would think of this. But it might be fun to try in storytime and see what the younger kids will think. The repeated phrases and vibrant illustrations make this one a good choice for talk. Word balloons illustrate the heated conversation between a father frog and his son when his son decides, for various reasons that being a frog isn’t all it’s cracked up to be. The young frog realizes there are some good reasons to be a frog. Absolutely fantastic story. Not only does it explain the reasons this little frog can't be a cat, rabbit, pig, or owl, but it also has a super funny ending that makes him happy to be exactly what he is - a wet, slimy, bug-eating frog. Super cute. Also, the last page sets it up perfectly for kids to write their own "I don't want to be a ...." story. Love this one, and imagine it would be great fun to read aloud. Perfectly hilarious writing by debut author Dev Petty, with Mike Boldt's illustrations pushing it all to the max. I could see this book being a favorite read aloud, especially for emergent readers. Great illustrations accompany the text. A fun story about self-acceptance. Dev writes books for kids which are also often enjoyed by immature adults. She was a senior visual effects artist in film and is now- thanks to her husband, daughters and pets, fully recovered from her chronic workaholism. She is also good at word jumbles. Really good. Dev was born in Berkeley, California and now lives pretty much in Berkeley, California.